When it comes to audio engineering and sound reinforcement, the verdict is in—nothing beats the warmth and musicality of analog sound. By incorporating state-of-the-ar t digital technologies into the development process of our premium professional analog equipment, the MGP is the next step in the evolution of compact professional mixers. The preamp is where sound creation begins, and ultimately determines the character and quality of your overall mix. 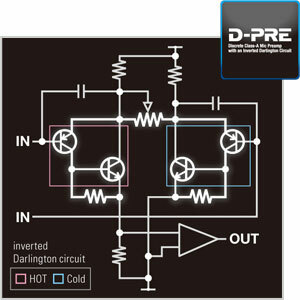 The importance of this critical first step inspired us to develop the most fat and warm sounding preamps possible—our newly refined D-PRE mic preamps. Initially intended for use with Yamaha's high-end recording gear, these studio-grade, discrete Class-A mic preamps employ an inverted Darlington circuit design that features multiple circuitry elements in a multi-layered configuration in order to deliver more power with lower impedance. This means all the character, depth and feel of your original signal will be delivered with fat, natural sounding bass and smooth, soaring highs. Rediscover a favourite mic or trusted instrument by capturing the full range of your musical expression with sound that you don't hear, so much as feel. With 48V phantom power for each channel and a sound that is incomparable in a compact mixer today, these studio-grade discrete Class-A mic preamps set the MGP apart, clearly defining a class all its own. Everyone knows vintage EQ sounds great—but not everyone knows why. Throughout the development of the innovative VCM (Virtual Circuit Modeling) effects used in our high-end professional digital mixers, we became increasingly focused on reproducing the warmth and musicality of classic vintage EQs. It was through our precise modeling of the original circuitry of some of the most sought-after EQ modules from the past that we discovered a characteristic “X-shape” of the frequency curves that was unique to these units— and would ultimately prove essential to unlocking real vintage authenticity. 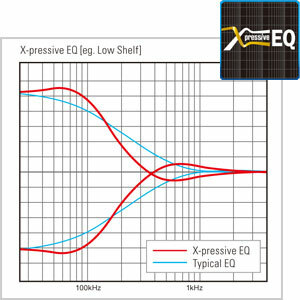 More than just a means of tweaking your mix, the precise response and very steep shelving of the high and low frequencies make the X-pressive EQ a powerful sound-shaping tool that essentially redefines the role that EQ plays in sound reinforcement. Never before has an audio engineer's contribution to the overall sound been so significant, with X-pressive EQ providing complete control of every aspect of your sonic palette. 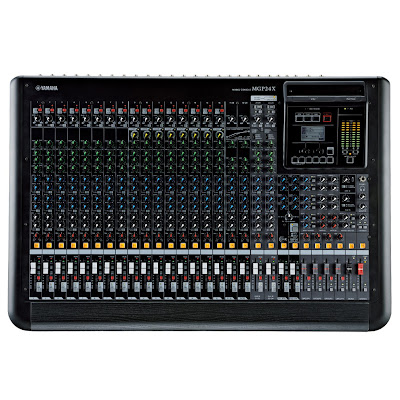 Originally a Yamaha innovation, 1-knob compression is now a popular feature on an increasing number of compact mixing consoles with good reason. 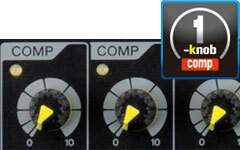 These intelligent compressors add optimally set compression to a wide variety of input sources with the touch of a single control—minus the hassle of setting up and configuring complex outboard gear. The MGP features our newly upgraded 1-knob compressors that feature LED indicators allowing you to visually monitor when the compression “kicks in” on each channel. 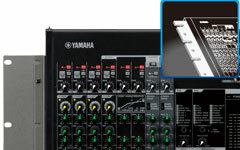 40 years of experience working with professional mixers has led Yamaha to offer a new way of approaching sound reinforcement in the digital age: the Stereo Hybrid Channel. 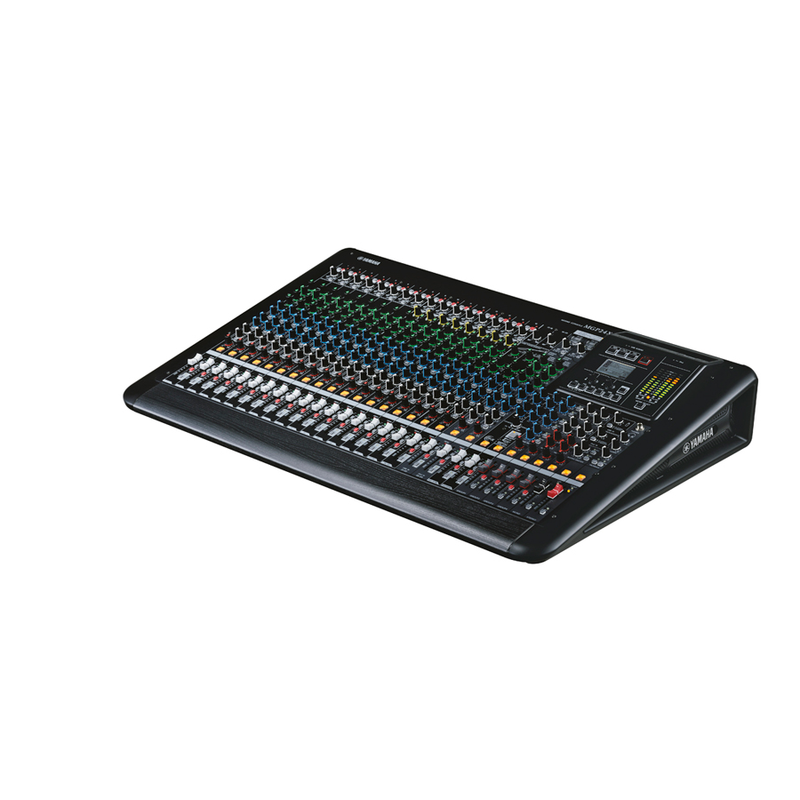 Beneath the analog-style knobs and encoders of MGP Series mixing consoles lies a sophisticated digital control system—a fusion that combines traditional analog feel with the functionality that only digital technology can offer. 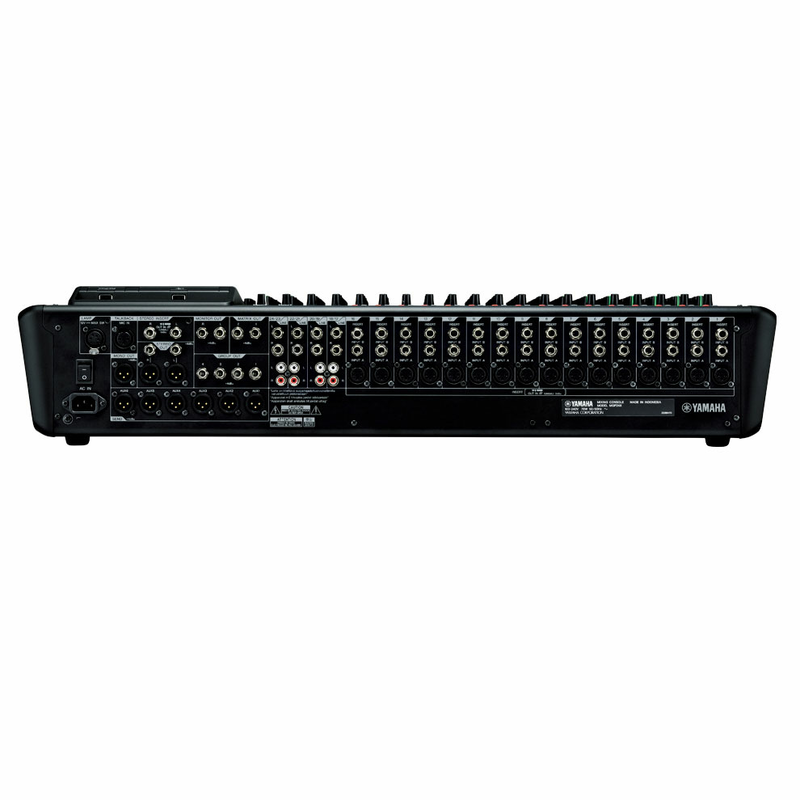 The MGP Series utilizes a powerful, proprietary DSP to provide three essential features that are staples of both installed and live sound applications. In keeping with the theme of analog simplicity found throughout the MGP Series design, each of these functions is readily accessible and available at the touch of a button. 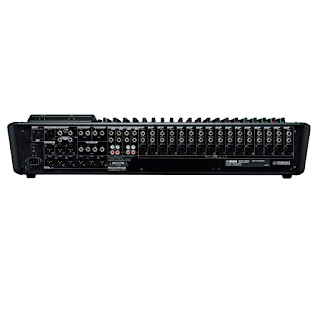 Featuring a mid-sweep, three-band EQ for nuanced sound control and high-performance onboard A/D and D/A converters, the Stereo Hybrid Channel offers unique functionality with superior sound. The Stereo Image function seamlessly narrows the pan balance of the stereo sound source so that audiences spread over a wide area can enjoy a comfortably blended mix. This is particularly helpful for installed sound applications that requires background music. Using either of the two optimized settings—MONO and BLEND— Stereo Image ensures that everyone is in the "sweet spot" by providing a more optimally mixed sound to the entire space. MGP Series mixing consoles offer two separate studio-grade effects processors for ultimate enhancement of your sound, with simple intuitive control. Yamaha's high-end REV-X reverb offers three very musical and natural high-resolution reverb effects: Hall, Room and Plate—a first for any Yamaha analog mixer. 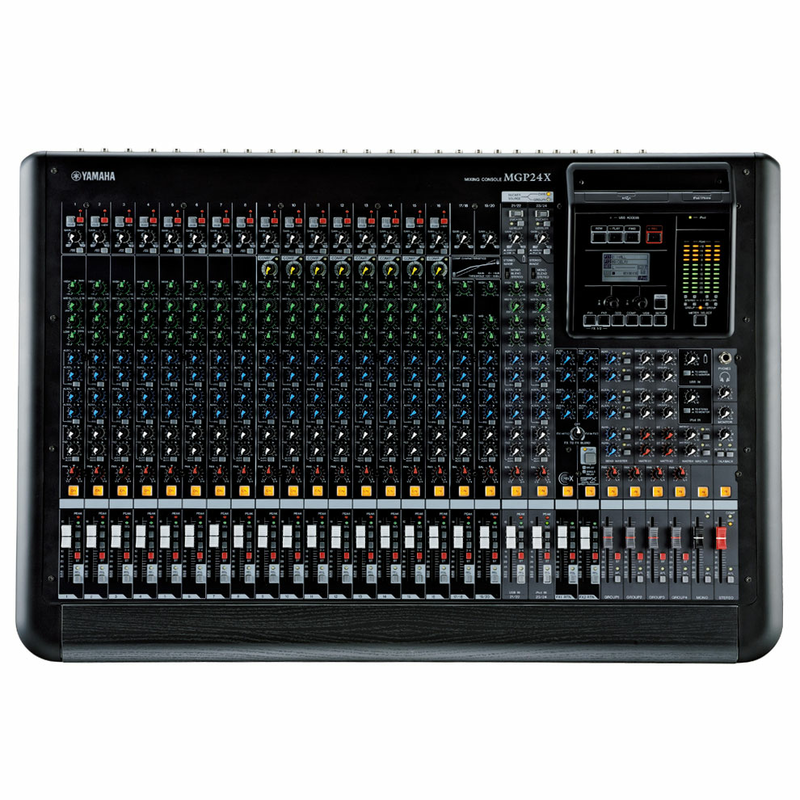 For more sound-shaping possibilities, Yamaha's renowned SPX digital multi-effect processor provides a useful selection of 16 advanced digital effects with editable parameters. 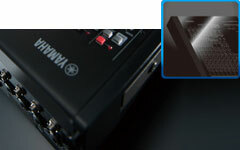 Both processors can be used simultaneously, giving you a vast array of tools to colour your sound. MGP Editor is a free software application that gives you additional control of your console's DSP settings via your iPod/iPhone. 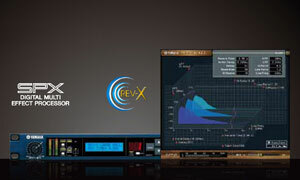 With a simple and intuitive graphic display, MGP Editor gives you additional, detailed control of your REV-X and SPX effects parameters—as well as Hybrid Channel's Priority Ducker, Leveler and iPod/iPhone’s playback settings. 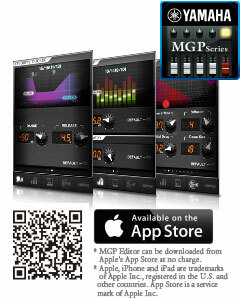 MGP Editor is a free software application that gives you additional control of your console's DSP settings via your iPod/iPhone. 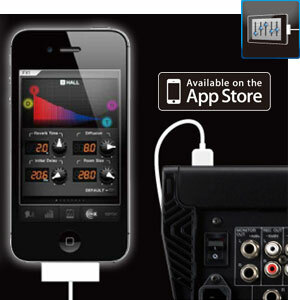 With a simple and intuitive graphic display, MGP Editor gives you additional, detailed control of your REV-X and SPX effects parameters-as well as Hybrid Channel's Priority Ducker, Leveler and iPod/iPhone's playback settings. With MGP32X and 24X, setting of GEQ and Master comp can be adjusted. Direct playback of iTunes play list is also possible. 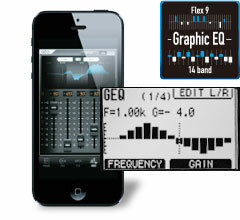 The new Graphic EQ feature 14 band and flex 9 band modes that can easily be controlled via internal display. 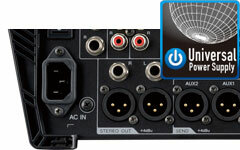 This Flex EQ is also used in Yamaha’s pro-level CL series consoles. By limiting the number of bands for boost and cut, the extra DSP can be employed to narrow the filters to 1/3 octave, and allow the user to sweep the filter to the range where adjustment is required. With 31 different filter positions, very fine adjustments can be made. Additionally, finding and reducing feedback is quick and easy using the offset/gain controls to point out vulnerable frequencies before the feedback occurs. The MGP32X and MGP24X are the first mixers in this class to be equipped with a master compressor on the stereo bus. 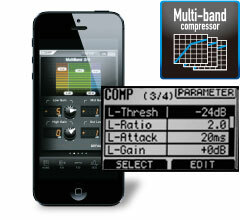 Both a standard type (COMP) and a three-band divided (Multi-band) master compressor have been built in. Using a master compressor allows you to reduce the overall dynamic range of the signal to fit the environment, and protect the sound system from overloads. A total of 8 memory scenes (3 read only and 5 user defined) allow settings to easily be stored and recalled as needed quickly. It's easy to archive every performance when recording is this easy. 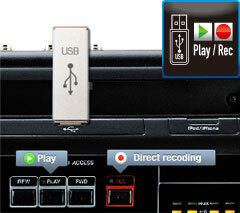 The record function allows direct recording to a conventional USB storage device. Choose from Stereo Out or Matrix Out 1 and 2 as the source, and select WAV or MP3 as file formats. Playback of audio files is also supported with the USB device. You can easily route this to a hybrid channel or to monitor out. [Notice] Transfer speed requirements are strict for recordings made in WAV format. Normal recording may not be possible when using certain stick type USB memory devices. We recommend using a USB hard disk with a fast transfer speed or an SSD (Solid State Drive). When recording in MP3 format, any stick style USB memory, hard disk, or SSD can be used.